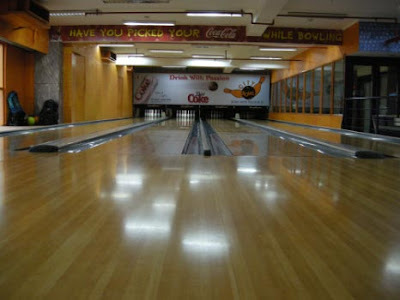 Noida has only two Bowling alleys. Yeah, read it again. 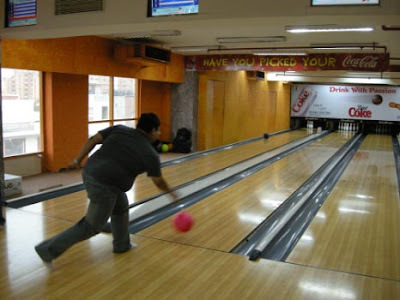 Even though Noida has seen tremendous growth in terms of Malls and ‘BPO Call Centres’, there are just two bowling alleys. 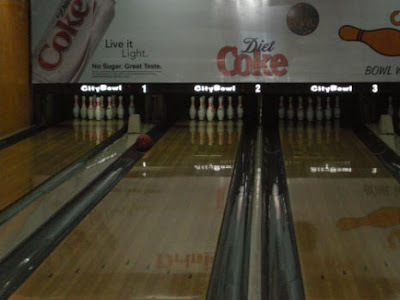 Out of this two, one of them just opened a few months back at ‘The Great India Place, Opposite Sector – 18’ and the other one which is been there for some time is at ‘Shoprix Mall’, Sector – 61 and is called ‘City Bowl’. There are four lanes and if you go on a week days there is a fair chance that you would find a lane for yourself. The charges are Rs 100 for a game in week days and Rs 125 in weekends and that includes Fridays. If you are 12 or more then you get a 10% discount or a free game. The quality of the lanes is decent and the infrastructure is also ok. It is not very uncommon to ask for help (pins not being picked by the picker, the system just get stuck , whatever) once for one game. But thats fine. 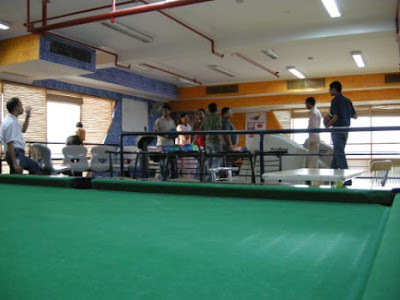 Apart from Bowling, they also have two pool table, an ice hockey table, couple of video games and snacks to munch. Its not very big but usually its not crowded as well. So all in all, a decent neighborhood joint to enjoy a game or two. A country which has more phones then water hand-pumps or clean toilets or almost every other thing really needed a ‘Do No Disturb’ registry. This is effective from Sep1,2007 and all telecom service providers need to maintain this registry. If you are registered and you get a call then you can complain and there are fines for first fault and greater fines for subsequent faults. There is no single registry so its a sort of pain, more so when in future we are talking about no portability and so on, but better then not having any thing. So why I am writing it all here, we all know it, whats new. Well, couple of weekends back I was driving at about 100 KMPH on a not so great highway, between Ambala and Zirakpur, the other important thing was I was driving a big car and the power-assist of brakes were not working. Which means that I was much more alert and tired because it used to take lot of effort to stop the car at times. It was early morning, other passengers were either sleepy or dis-interested, so amid all this a bulb flashed and I thought that why not have a ‘Do Disturb’ registry. Instead of asking everyone to get added, we would rather do the opposite. It would be nightmarish for tele-callers since the default would be NO, and I doubt how many of us would take the pain to add them selves to ‘Do Disturb’ registry. Once such a database is up then we can give access to this DB to telemarketers for a service fee. Also mechanisms could be put in place such that a subscriber to DoDisturb doesn’t receive more then 3 calls a month or a some golden no. To scale this system, we can have ip-telephony software and one can call only using that s/w so we also rope-in telecom providers. I am sure if I create such a registry today, we would definitely get some good ideas and can evolve and refine this. But I think its a decent thought to be pondered more. Everyone was making a big thing out of this year’s ID. It is our 60th independence day so that would make it two generation old. 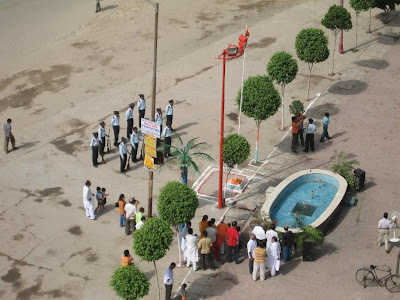 In my apartment block, we had the traditional flag hosting and I clicked some pics. This is from my 8th floor so its not clear but nevertheless. And here is the video, courtesy youtube. I do not have the complete thing but the guys actually did fire from guns, so as to salute and then did a small march. There was sweets (Jalebi) distribution to each household later. Smita was driving back home when she called me on my cell to look out of my office window, I work for Adobe India and my office has this large glass windows which overlooks the fields between Adobe and Spice World Mall, So I looked out and after some directional tuning, I could see a Rainbow. I went out and I could see the whole bow, guess for the first time in my life, I have seen such a complete thing. Being in Photoshop Elements group, we have some of the better cameras so some of us rushed to the terrace and Swapnil clicked this. Lovely. There are two of them. 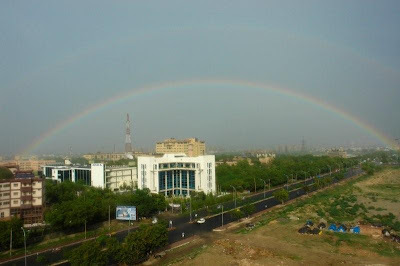 This is shot from Adobe Sec 25 A Noida and the road which you see is the one which connect NTPC with Chauda Mode. Just back after a 2.5 hour drive to a new area which is being developed. Its near NH58. If you are coming from Delhi and going towards GZB towards Anand Vihar, Dabur, Vaishali, Vasundhara or from the Shahadara side then you hit Mohan Nagar (yeah, of Mohan Meakins fame). 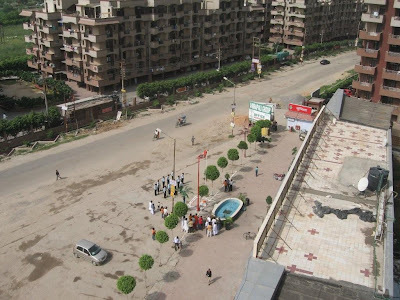 From Mohan Nagar, drive towards GZB and you will hit Hindon, cross the river and look for a exit on the left. Its a kuccha road, sustain the drive for 7 odd KMs and you would start to see the development work. This kuccha road is billed as the swanky 6 lane expressway which will connect to NH58, the road that leads to Roorkee and then to Haridwar. It will take a while to get this work done but once thats done, you would be able to avoid a better part of GZB. Currently there is nothing much in this area, some villages, couple of re-hab colonies and an Ashram here or there or few nurseries. Some of the builders are Garg builders (River Heights), KDP Infrastrutre, Grand Savana from someone, Ashiana etc. There is no big builder of repute (ATS, Supertech, Unitech, Ansals, KrishnaApra etc) who is active as of now. The quoted price is Rs 1750 per sq feet. I guess if you go with the money in your pocket, you should get it for Rs 1500 and withs other goodies thrown in like Free Parking etc.